The BHS Scissor Lift Table vertically positions materials at comfortable heights for improved ergonomics and productivity. Reduce physical strain, fatigue, and even injury by eliminating heavy lifting, bending, and reaching. Scissor Lift Tables are available in many standard sizes and capacities to lift and position loads weighing up to 6,000 pounds (2722 kilograms) to heights up to 72 inches (1829 millimeters). Improve safety and productivity by investing in this ergonomic equipment. 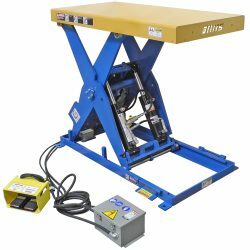 BHS offers a number of alternate tabletops for the Scissor Lift Table. Ball Transfer, Turntable, and Roller Conveyor tabletop attachments can make your operation even more effective, and they fit seamlessly with existing manufacturing processes. An Accordion Skirt Guard is available to enclose the underside of the lift table for extra protection from dirt and foreign objects. Heavy-duty steel gives you years of reliable operation, while the included maintenance chocks let you lock the scissor lift for safety. BHS Scissor Lift Tables are an excellent choice in warehouses, auto shops, and in dozens of other applications, and we offer a variety of options to suit your facility. Contact your BHS dealer or call +1 314 423 2075 for ordering information and customization options. Download the PDF at the top of this page for full specifications. For use in High Cycle warehouse settings. 200,000+ cycles per year. A permanently fixed self-propelled DC powerhead drives the lift table. The frame is equipped with additional casters for easy maneuvering.